Do your trees have leaves that are turning yellow or falling off prematurely? Are there sections of your trees that are diseased, dying, or infested with insects? These are symptoms of common tree problems that can weaken your trees and cause them to die. In addition, weak trees are more susceptible to strorm damage and can threaten your home and property during high winds. 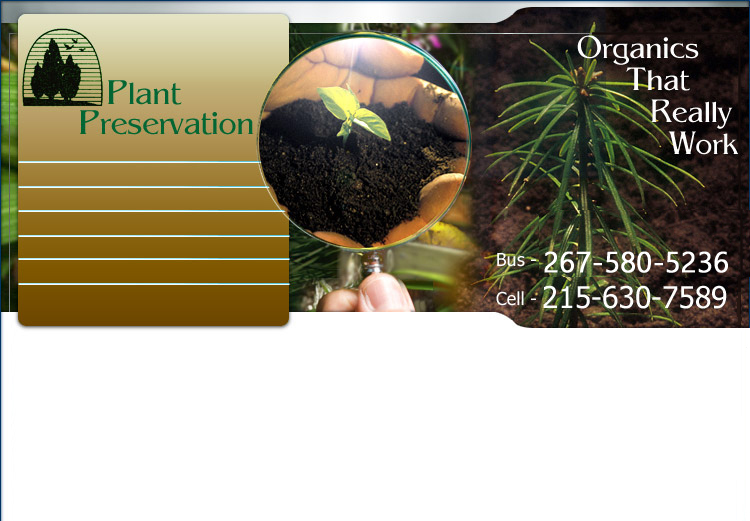 At Plant Preservation, we specialize in solving problems regarding the health of your trees and shrubs. Left untreated, tree diseases and tree insect problems can require removal costing you thousands of dollars. And replacing a mature tree can cost thousands more. At Plant Preservation, our trained ISA Certified Arborist can diagnose and treat tree health problems with cost effective treatments that can save your valuable trees. In many cases, sick trees can be restored to good health by improving the soil in which they live. We treat the soil with highly organic materials and organic fertilizers that actually help the environment unlike most conventional fertilizers commonly used today. A beautifully landcaped property can enhance the value of your home. But over time, some flowers, shrubs, and trees lose their vibrant color and produce smaller and fewer blooms. Using specialized organic materials, we can enhance your landscaping by allowing your trees and shrubs to produce larger flowers, fuller flower blooms, and more vibrant colors. Using proprietary organic fertilization techniques, we can revitalize your landscaping and enhance it's natural beauty.